On November 21, the annual Union Square Holiday Market opened for business with 150 booths hawking items from jewelry to clothing to artwork to toys, all from small businesses and artisans. The market, located at the south end of Union Square Park, will run seven days a week through Christmas Eve. Since the selection of items can feel overwhelming, Town & Village has rounded up a list of suggested gifts. Many are handmade and unique items designed by local craftsmen and women. Denise Delong’s ceramics depict city landmarks and scenes. For those considering purchasing artwork as a gift with the city as a subject, Holiday Fair artist Denise Delong makes relief ceramics showcasing landmarks like the Flatiron Building and Brooklyn Bridge, as well as random subway scenes. Pieces from Delong Ceramics, about a square foot in size, come wall-ready with a wire screwed onto the back, and cost $100-$145. There are also sets of four coaster-size mosaics, like one set depicting the Metropolitan Museum of Art, for $50. Another New York centric-company is Insiders1, whose designer Sigal de Mayo, with husband Fabio Otalora, makes men’s and women’s wallets depicting various scenes in Manhattan and Brooklyn. The goods are manufactured at the Brooklyn Navy Yard. Sales rep Cecily Witcher noted the popularity of the leather wallets ($50) among tourists as well as locals. The market also has more than a few toy vendors, with products that often wind up being as popular with adults as they are with kids. One of them is Real Life Inspired Planes, which, true to its name, makes mobiles with models of planes inspired by actual plane designs, fashioned out of metal and clay. Each plane comes with a pilot inside. Prices run from $80-$120, but most cost $95. Dezignmine is a company whose owner Mick Joseph designs bouncing animal mobiles that cost $20 apiece. Other items, like clove boxes, and batik on wood bowls, are made by artisans Joseph and her co-owner husband Claus Ronnex-Printz work with in Bali, Indonesia. 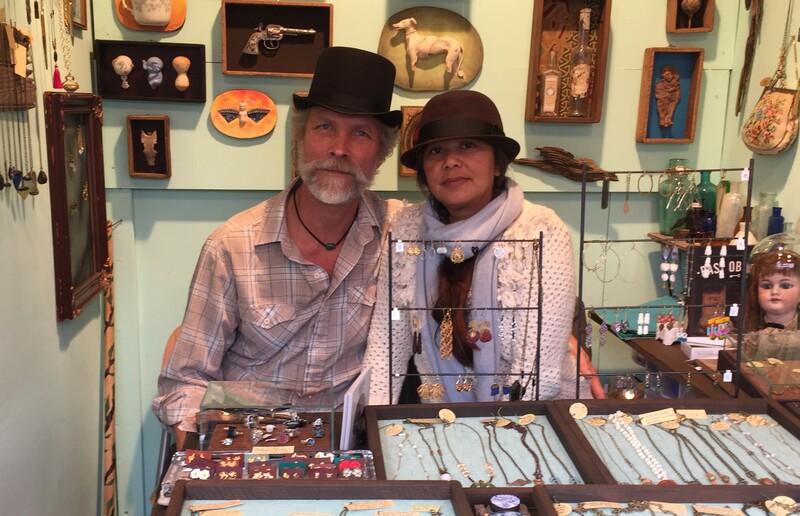 For one-of-a-kind jewelry pieces that are often antique or made with antique materials, the place to head is Belle Costes & Scott Jordan Artifacts, Art and Jewelry. The designing duo, also a couple who lives in Queens, always have a story behind each necklace or brooch they sell. Sometimes it’ll be a vintage pendant they’ve acquired that Costes has reworked. Other times it’s new, but made with something old Jordan will find on one of his digging expeditions like dried flowers or a lost key. “Instead of going out for dinner, we went digging on Thanksgiving,” said Jordan, and he isn’t kidding. Lest anyone need proof, at the booth, there’s a photo of him at work in a ditch somewhere in Brooklyn. That dig was productive, netting him some 1860s era doll parts and coins. On another recent day, Jordan acquired some materials after talking some construction workers who were about to raze an area into letting him scavenge it first. “I try to save something before the machines tear it up,” he explained. Another option for one-of-a-kind pieces is Brooklyn-based company Hanami, whose jewelry is made from real flowers. All the earrings ($35-$45) and pendants ($49-$55) are made from brightly colored orchids, which go from delicate to durable after being dipped in resin. A popular gift item for men this year can be found at Brooklyn Brewshop, a manufacturer of home beer-making kits and cider making kits ($40 for either kit). The company’s holiday market coordinator Brielle Schiavone said the kits, which come with everything needed to make beer, was specifically designed to be small enough to work in a typical New York City kitchen. “This takes up less than a square foot of space, unlike the five-gallon model, which is the industry standard,” said Schiavone. She noted that she wouldn’t be giving it to anyone this year, instead preferring to buy a model for herself. It will, nonetheless be the gift that keeps on giving. “I’m brewing my own beer so I can give people six-packs for Christmas,” she said. A more traditional Christmas gift, gingerbread, has been given a twist at a sliver of a booth run by German Delights. The company sells chocolate covered and frosted gingerbread in decorative tins that are designed to look like gingerbread houses, and, once emptied, can also be used as lanterns. The flames from the candle placed inside are visible through windows of the gingerbread house. Another style of tin available is round and a working music box. Those gingerbread tins are $29 each while the lanterns are $27. Karma Living is a U.S.-based company that works with artisans in numerous countries, including India, Peru, Colombia and Mexico, to manufacture decorative pillows. The pillows come in the shapes of owls, Russian dolls and sugar skulls as well as traditionally shaped rectangles with intricate Day of the Dead inspired or animal designs. Depending on size and design, prices range from $15-$45. Along with a large selection of silver jewelry and silk scarves, East Village-based business Himalayan Vision, also carries leather-bound journals with recycled paper. The journals come in a few different sizes, small, medium and large, and cost $10, $15 and $18, respectively. There’s also a selection of painted journals costing $9-$12. Himalayan Vision also has a boutique that’s open year-round on Second Avenue between 7th and 8th Streets. Shan Shui-Gallery of Fine Arts is a jewelry company that specialized in jade pendants, but also has a selection of unisex spin rings. The rings, which come in silver as well as tungsten and brass, do in fact spin, and are said to help alleviate anxiety. Prices range from $32-$35. With cold weather comes dry, chapped skin, and Dr. Sofskin’s is here to help. The Harlem-based business makes an organic ingredient-based moisturizer candle that’s used when lit and melting. The candle, which is long lasting, comes in a tin. Three and a half ounce jars are $18 or $50 for three. The company, which previously only made this one product, has already recently branched out with a line of long-lasting soap ($10 a bar) and regional director Jacqueline Sheridan said there are currently plans to open a store in 2015, possibly a few blocks north of Union Square Park. Great market and great picks! Dr. Sofskin’s is one of my favorite shops there. You forgot to mention their shaving products. The shave cream and beard conditioner are awesome!